Have I mentioned that I love movies? Oh, I did. Oh, you can tell. Oh, I can’t seem to have a single thought without relating it to a movie you “just have to see.” Well, I hate to be the bearer of bad news, but I don’t think my love of movies is going anywhere fast. I’ve always wanted to be a part of making movies, part of the “dream factory.” In Indiana, this dream felt like a faraway calling, a quest that I would never be quite ready for. In California (more specifically, in Malibu), the dream makers are everywhere; although they just say they’re in the “industry.” I like dream makers more; it’s very Inception; you just have to see Inception. (Told you. It’s a tick.) The industry folk are quite literally my neighbors (yes, even in the “prefabricated homes” park), and there are moments that are so very surreal, it’s surprising I haven’t fainted. For instance, I drove by Dustin Hoffman walking on a beach street. I waved at him, and he waved at me; I cried for the next ten minutes and wrote several drafts of a fan letter explaining what that wave meant to me (don’t worry, I didn’t send it). Another one of these surreal gems happened this weekend. Rob, Jill, Rachel, and I (and I smell a fantastic friend group here), went to see Gravity at the GRAUMANN’S CHINESE THEATER. As in, where Star Wars first premiered. As in, had to step over Julie Andrews’s handprints to get inside. As in, I could have danced with a Spiderman impersonator on the way out; okay, that one isn’t super cool. Although, that’s not quite what I mean because I already have so many of my dreams. Dustin Hoffman is just a person, everybody (mostly talking to myself: “Stop crying.”). 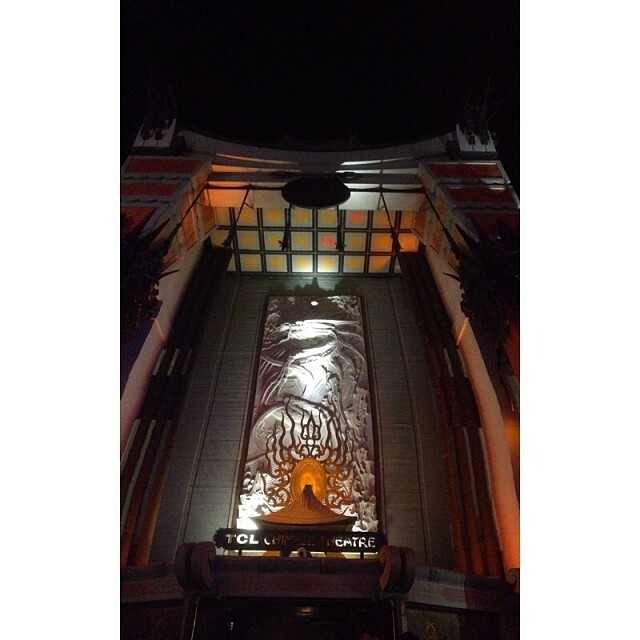 The Chinese Theater is just a building. And movies, as much as I love them, are just movies. It’s how these people, places, and artworks invade ourselves that really matters; that’s what gets me excited about movies. It’s who I am and how I treat people that defines the level of success in my life. I love movies, but I love goodness more. I think the two of them can be friends, like Lethal Weapon (Mel is movies, Danny is goodness). You just have to see that movie.